Sights, art, architecture and history of Perugia, Italy. Perugia is one of the most attractive towns in the area of northern Umbria and southern Tuscany, Italy, both in terms of its ambience and its art, architecture and history. Perugia should on no account be missed if you are visiting central Italy. Perhaps nowhere else in Italy are the material remains of the Etruscans so clearly evident as in this city. The churches and fountain of the main piazza are well-known masterpieces, but there are numerous minor churches of great interest, most notably the Tempio di San Michele Arcangelo. 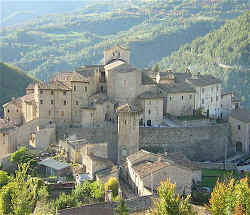 Within easy reach of Perugia, there are a number of hill towns in Umbria that are worth a visit. One example is Corciano, a small mediaeval town situated on a hill 5 miles from Perugia, on a detour of the road to Lake Trasimeno. Corciano was under the rule of Perugia until the 16 C, when it was annexed to the Papal State and became Corgna family's domain. Corciano is surrounded by a fine circuit of walls and fortified towers and the splendid castle dominates the maze of narrow alleys and flights of steps that connect the piazzas and their beautiful architecture. Some of the public buildings have spectacular interior decoration. The Piazza IV Novembre forms the centre of Perugia which speads outwards along the steep alleys leading to the walls of the original Etruscan settlement and the ancient gates of Porta Marzia, Porta Sole, Porta Cornea, Porta Trasimena, Porta della Mandorla and the Arco Etrusco. The piazza is one of the most beautiful squares in Umbria, indeed, in all of Italy, surrounded as it is by fine buildings. 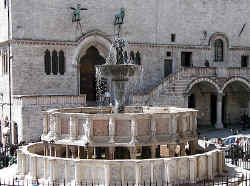 Fontana Maggiore is located at the centre of Piazza IV Novembre. This beautiful mediaeval fountain was erected in the second half of the 12 C at the termination of the aqueduct that carried water to the town from Monte Pacciano. 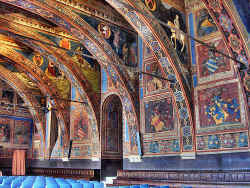 The architect was Fra Bevignate da Perugia and the sculptural decorations were created by Nicola and Giovanni Pisano. The fountain is composed of two superimposed polygonal basins, faced with marble reliefs representing biblical and mythological individuals, saints, animals and personifications of the months, the sciences, the virtues and places. The fountain is one of the finest examples of Gothic art in Italy and was the symbol of the city at the peak of its power and influence. 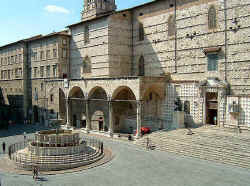 Click here for Perugia hotels, vacation rentals and holiday homes. The work of building the Cathedral of San Lorenzo took more than a century, finishing at the end of 1400s. The left side, facing the square, has a bronze statue of Julius III, the portal by Ippolito Scalza, and large Gothic windows, plus the elegant arches of the Loggia di Braccio, erected in 1423. Under the portico there is a section of the Roman walls, the base of the old bell-tower and a copy of the Pietra della Giustizia (Stone of Justice), a document of the Comune dating back to 1200. The façade of the church, facing onto Piazza Danti, was remodelled in Baroque style. The interior, divided into three naves, contains distinguished works of art, including the Cappella del Santo Anello, preserving, according to tradition, the ring of the Virgin, the Cappella di San Bernardino; the very fine choir stalls by Giuliano da Maiano and Domenico del Tasso. Deruta is only 15 km south of Perugia and is well worth a visit. 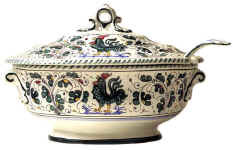 It has been a famous ceramics centre for centuries and a number of characteristic ceramic styles are still produced and available at very affordable prices. Another side of the square is occupied by the Palazzo dei Priori, which was the residence of the principal political authorities of the city during the Middle Ages. Construction was begun in 1298 and the work was completed in 1353. The palace is built of travertine and red and white stone from Bettona, and on the side facing the fountain it has a large stairway and a portal which gives access to the beautiful Sala dei Notari, a rectangular room with a vault supported by huge Romanesque arches and walls covered with frescoes. The façade has two lines of mullioned windows with three lights and a portico. The side of the palace facing onto Corso Vannucci has an undulating development and is characterised by mullioned windows with three and four lights, and a magnificent round portal. The interior of the Palazzo dei Priori comprises the National Gallery of Umbria – the most important collection of art in Umbria for the Mediaeval and the Modern periods – and, on the ground floor level, the Sala del Collegio del Cambio and the Sala del Collegio della Mercanzia. The Guild of Merchants established its seat in this palace in 1390 and decorated their meeting room with wooden panels, a very unusual decoration, rather rare in Italy. 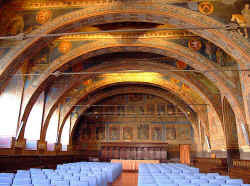 The Guild of Moneychangers occupied this wing of the palace during the half of the 15 C. in this room can be admired the most important work by Perugino in Perugia, one of the most significant examples of Renaissance painting in Italy: a series of frescoes representing the heroes and deities of antiquity and some personified virtues. The Basilica of San Domenico, a massive structure, was erected, according to Vasari, by Giovanni Pisano in the 1304 in the place where, in the Middle Ages, the market and the horse fair were held, and where the Dominicans settled in 1234. Around the 1614 the vaults and pillars of the nave collapsed and after the reconstruction by Carlo Madeno of Rome, the church was re consecrated in the 1632. Inside, there are Gothic elements, renaissance windows and the tomb of Pope Benedetto XI. 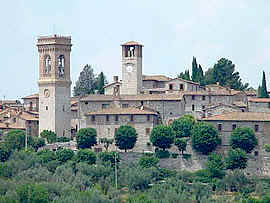 The Archaeological Museum of the Umbria and the State Archives are housed in the adjacent monastery and cloister. 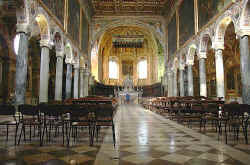 The Church of San Pietro, a Benedictine abbey, was founded in the 10 C on the Monte Calvario. It functioned as the cathedral of Perugia in the 6 C (located outside the town walls at that time), prior to the status of cathedral being given to Santo Stefano in Castellare (demolished during the construction of the abbey and church of San Domenico) around 936 and then finally to San Lorenzo, the current cathedral. The minor cloister (or 'delle Stelle'), was designed by Galeazzo Alessi in 1571. The main court is dominated by the polygonal clock-tower, supposedly built on the site of an Etruscan tomb that was used for its construction in the 13 C. After a partial collapse, the upper section was rebuilt in 1463 to plans by Bernardo Rossellino. The interior is a mixture of ancient columns and has a Palaeochristian basilical structure. The Gothic wooden choir is considered to be one of the finest in Italy and was completed between 1525 and 1591. The painted and guilded wooden lacunar ceiling is from 1556, while the large quantity of frescos and paintings by various artists include some by Antonio Vassillacchi (1592-94), Sassoferrato, Guido Reni, Vasari, Guerricino and Perugino (Pietro Vannucci). The sacristy was added in 1451 and contains inlaid furnishings from 1472, as well as the remains of a pavement in Deruta tiles. The frescoes are by Danti and Peccenini. The paintings hanging here are by Perugino, Parmigianino and Raphael. A door in the apse of the wooden choir leads to a tiny balcony that affords a stunning view over the Valle Umbra as far as Assisi, Monte Subasio, Bettona, Montefalco and the Apennines. Among the oldest churches in Perugia is the Temple or Church of Saint Michael Archangel (Tempio di San Michele Arcangelo, Chiesa di Sant'Angelo) probably dating from the 5 C but constructed on the remains of a Roman temple which in its turn was built on a site sacred to the Etruscans. 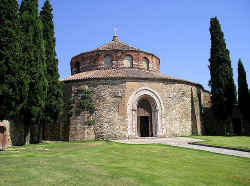 The structure consists of a single circular central nave housing the altar and a concentric ambulatory. 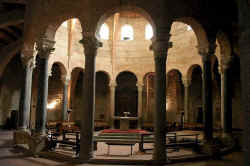 A series of sixteen columns originating from a previous structure separate the ambulatory from the presbytery, in a manner typically romanesque manner and similar to the design of Santo Stefano Rotondo. The two chapels are noteworthy. Originally there were four, located on the external perimeter of the church and conferring the form of a Greek cross. It is not certain whether the original form of the architraves that support the ceiling are those that we see today. The supporting arches are in gothic style, both in the central area and peripherally. The church was rebuilt in the 15 Cy and the interior is now almost entirely covered with frescoes. The small community of inhabitants of Gavelli commissioned Lo Spagna to paint what would turn out to be one of his most important cycles, which depicts the Virgin, St Peter and St Paul, St Michael the Archangel and the Gargano Miracle. Click here for a places to stay in Chianti - luxury villas, village apartments, vineyard Bed and Breakfast rooms, or an agriturismo with pool. Vorresti pubblicizzare la tua attività su questo sito web per Perugia e ricevere traffico in entrata dalla nostra rete di più di 50 portali relativi? Clicca qui per ulteriori dettagli in merito alla nostra soluzione integrata per una presenza su internet per ulteriori dettagli in merito alla nostra soluzione integrata per una presenza su internet piena di successi. Perugia Tourist Information © 2005 - 2018 ammonet InfoTech website design and promotion. All rights reserved.